Addie loved meeting her Great Grandma Nan, who you can read more about here. Grandma would have to correct me if I'm wrong, but I believe Addie is the 33rd great grandchild. Priceless:) What a treasured moment. I didn't get to experience the blessing of having a grandma because they both passed away before I was born. 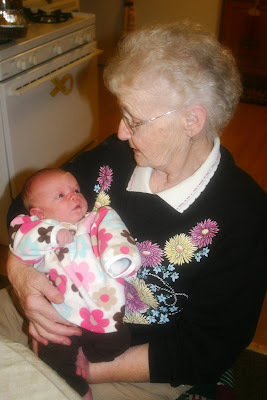 Children who have grandmas & great grandmas are richly blessed. Thank you for sharing this. That is wonderful that you are close to Sean's and your relatives.. It means so much.